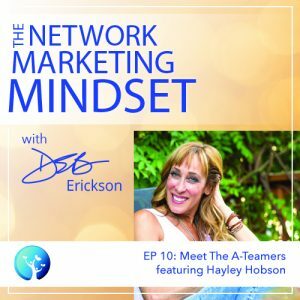 In this installment of Meet The A-Teamers, Deb talks to million-dollar earner and network marketing rockstar, Hayley Hobson, diving into what has enabled her to become one of the top-ranked people in her entire company. Learn from her path and outlook to guide you to achieve your own success. The importance of bringing real fire for your business goals to everything you do. The difference between selling, marketing, and convincing, and when each is appropriate. How do you know when the person you’re considering to recruit really has what it takes to make it. Hayley Hobson is an author, speaker, Kick-A$$ Business Guru and 7-Figure MOM-treprenuer who creates lifestyle transformations by coaching her clients to become the best WHOLE versions of themselves possible. A doTERRA Certified Oil Double Presidential Diamond, Hayley can be increasingly found speaking at global business events. She is the creator of the online business mentorship training programs Your Whole Biz, Social Downline and Whole MOM-trepreneur, and her insights and articles on empowering others to live the lives of their dreams can be found on her personal blog and on Mindbodygreen, Positively Positive and Elephant Journal. Hayley has been featured in Pilates Style magazine, Natural Health magazine, Bridal Magazine, Triathlete Magazine, doTERRA’s Leadership Magazine, the Four Year Career by Richard Bliss Brooks and the Network Marketing Times. She has fun living, working and playing in the Colorado mountains with her husband, former world-ranked triathlete Wes Hobson, and their two beautiful daughters Makenna and Madeline.